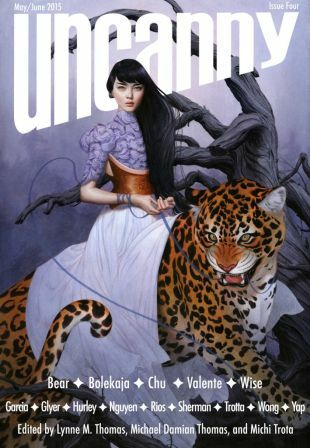 The second half of Uncanny Magazine Issue #4 is available to read free today. Tributes to the late Peggy Rae Sapienza by Christopher J Garcia and Steven H Silver are among the newly-released material. Peggy Rae Sapienza at the 2007 Capclave. Photo by Ellen Datlow. 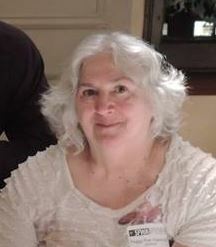 Peggy Rae Sapienza, one of fandom’s most admired conrunners and fan guest of honor at Chicon 7, the 2012 Worldcon, passed away March 22 from complications following heart valve replacement surgery. She was 70. Her highest profile achievements were chairing the 1998 Worldcon, Bucconeer, and co-chairing the 2014 World Fantasy Con. She also served as Vice Chair and then Acting Chair of the 1993 Worldcon, ConFrancisco, helping stabilize the committee in the period after chair Terry Biffel died and before the appointment of Dave Clark as chair. In addition, she chaired two Smofcons (1992, 2004) and a Disclave (1991). People liked to work for her — including some who thought they were done volunteering before she called. Peggy Rae’s unique leadership style combined playfulness, the appeal of being admitted to an inner circle, knowledgeability, and a frank demand for results. She had an unlimited resume in many areas of convention organizing – press relations, program, registration, guest of honor book, and exhibits. She also felt it was her mission to pass on the skills and experiences she possessed. A number of the current generation of Worldcon organizers called her a mentor and today are mourning her loss in their own way. “I feel like a whole library just burnt down,” Glenn Glazer wrote on Facebook. 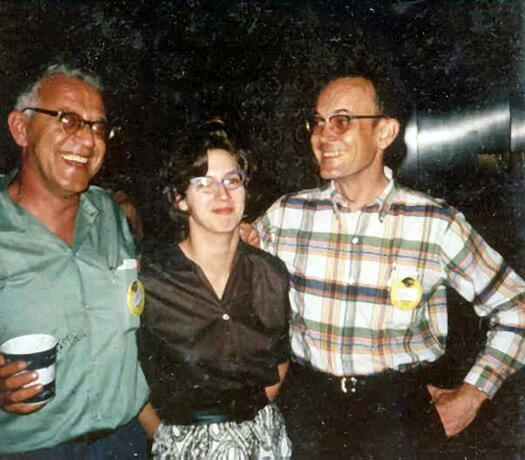 Peggy Rae McKnight met Washington-area fanzine and convention fan Bob Pavlat at her first Worldcon, Pittcon, in 1960. They married in 1964 and had two children, Missy Koslosky and Eric Pavlat. In 1983, the couple received fandom’s Big Heart Award. That same year Bob passed away. In 1999, Peggy Rae married John T. Sapienza, Jr., a government attorney and longtime fan. One of Peggy Rae’s enduring contributions to how Worldcons use facilties is the ConCourse, which she and Fred Isaacs invented for the 1989 Worldcon, Noreascon Three. The Sheraton had denied the use of its facilities to the con due to some problems, forcing the committee to create attractions in the Hynes Convention Center to compensate, or later, when they regained the Sheraton through litigation, to keep crowds in the Hynes for the sake of peace with the hotel. Their solution was the ConCourse which, with the Huckster Room and the convention program, gave members ample reason to hang out in the Hynes. The ConCourse amalgamated fanhistory exhibits, convention information, the fanzine lounge, the daily newzine publishing area, convention bidding and Site Selection tables, and a Hynes-run snack bar in one place, and layed it out as an indoor park. Fans responded so positively the idea was used repeatedly by future Worldcons, and many of the exhibits Peggy Rae commissioned are still being presented. This was also when the expression “I mowed Peggy Rae’s lawn” originated. Some of the planning for Noreascon 3 took place at her house, she explained during a 2012 interview. A friend arrived before a meeting while Peggy Rae was gardening and offered to help. In a kind of Tom Sawyeresque moment, others came by and joined in the gardening. Joe Mayhew was a witness, and years later warned people that if they voted for the Baltimore Worldcon bid they would end up having to mow Peggy Rae’s lawn…. For many years Peggy Rae was a key planner and motivator in the effort to preserve fanhistory. The Society for the Preservation of the History of Science Fiction Fandom, AKA the Timebinders, was formed at FanHistoriCon I in May 1994 in Hagerstown, Maryland, convened by Peggy Rae, Bruce Pelz, and Joe Siclari to gather fans of different fannish generations together to discuss the best ideas. 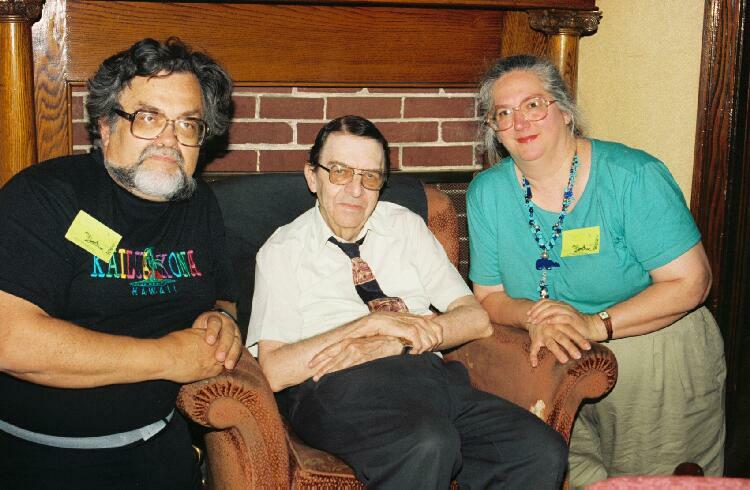 Bruce Pelz, Harry Warner, Jr. and Peggy Rae Pavlat (Sapienza) at FanHistoriCon in 1994. Photo by Rich Lynch. Peggy Rae worked 16 years as a contractor for the Department of Labor in Washington, D.C. in UNIX systems support, retiring in 2000. In her later years she was instrumental in supporting the 2007 Japanese Worldcon as their North American Agent. She chaired SFWA’s Nebula Awards Weekend in 2010, 2011 and 2012, earning a tribute from John Scalzi. She was part of the DC17 bid for the 2017 Worldcon. Just this past fall, Peggy Rae helped me put together a couple of programs for Smofcon 32 and I find it especially hard to accept that someone so filled with ideas, imagination and energy can be taken away. Peggy Rae is survived by John, her two children, and eight grandchildren. Update 03/24/2015: (*) Eric Pavlat in a comment below says that Peggy Rae will not be interred at Arlington, but will be buried this Saturday at Fort Lincoln Cemetery in Prince George’s County, MD. 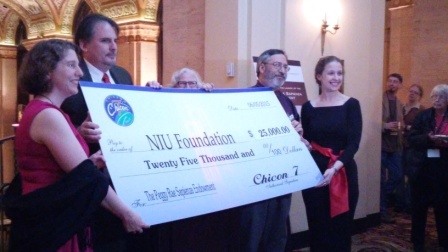 The winning bid for 2012 has now officially morphed into Chicon 7. The Guests of Honor will be author Mike Resnick, artist Rowena Morrill, astronaut Story Musgrave, fan Peggy Rae Sapienza, and “industry” (it says on the website) Jane Frank. Rowena Morrill is a highly acclaimed artist with a career spanning over 20 years. 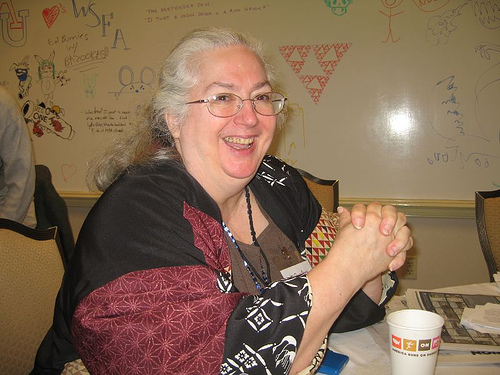 Peggy Rae Sapienza chaired Bucconeer, the 1998 Worldcon, and has provided leadership at lot of other Worldcons. She assisted Nippon 2007 in many ways while serving as its North American agent. 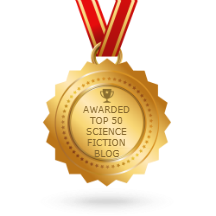 Her father, Jack McKnight, machined the first Hugo Awards in 1953. Peggy Rae was active in the Philadelphia Science Fiction Society in the late 1950s. She won the Big Heart Award in 1983. Jane Frank has been a collector for decades and has run WoW-Art since 1991, selling illustrative genre art. John Scalzi will be Toastmaster. Update 09/05/2010: Aussiecon 4 later issued a very nice press release, which I have added after the jump.